I read this article and found it very interesting, thought it might be something for you. 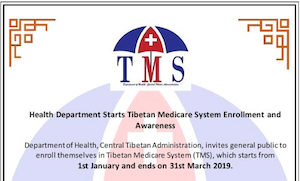 The article is called Rejuvenating Support for Tibet in Finland on CTA President’s maiden visit and is located at https://tibet.net/2018/10/rejuvenating-support-for-tibet-in-finland-on-cta-presidents-maiden-visit/. 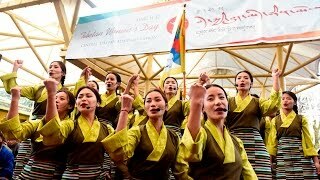 Helsinki, 11 October: President Dr Lobsang Sangay, Central Tibetan Administration arrived at Helsinki airport on Thursday night for the last leg of his four-nation Europe visit. This is CTA President’s maiden visit to Finland. 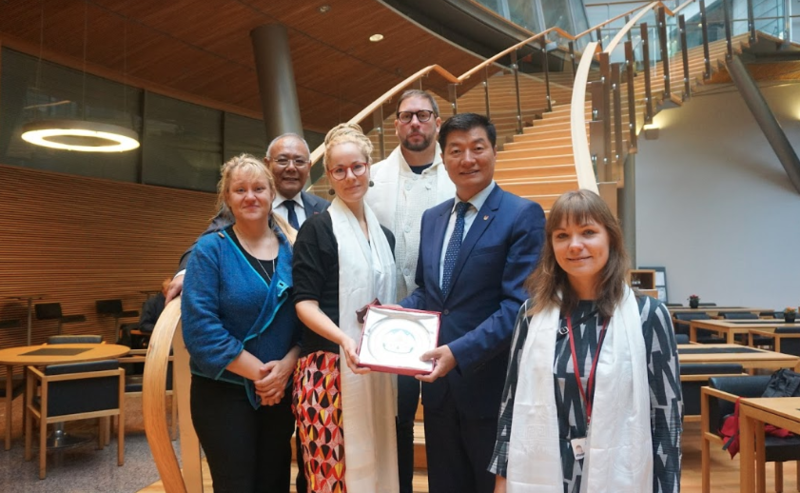 He was received by Mr Sonam Tsering Frasi, Representative of His Holiness the Dalai Lama for Northern Europe; Ms Erja Sini-Kaarina Varis of Finnish Tibet Committee; and the few Tibetans living in Finland. CTA President’s first public event on his official engagements in Finland began the next day with a lecture at the University of Helsinki, the oldest and largest university in Finland, titled “Legal and political representation of non-state people in politics: Tibet case”. 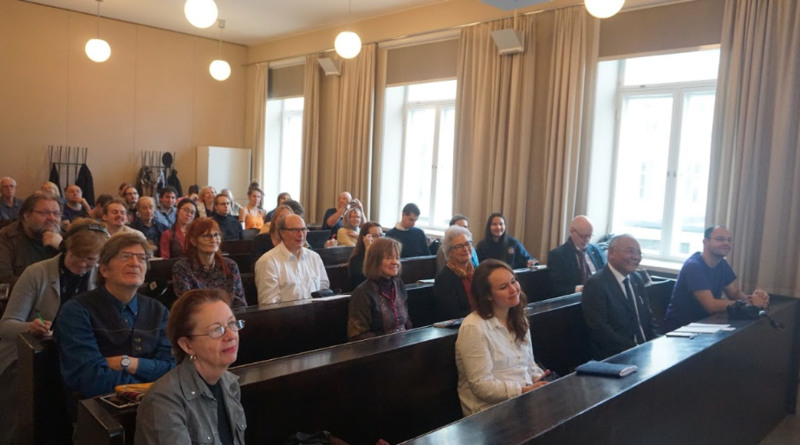 He was introduced to the packed room of select audience consisting of students, faculty and public, by the host Prof Teivo Teivainen, Professor of World Politics at the University. 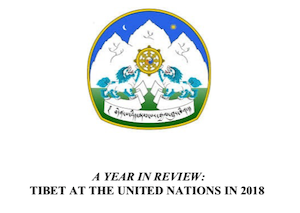 President Dr Sangay delved right into the subject by providing the legal arguments justifying Tibet’s status as an independent country in the past. 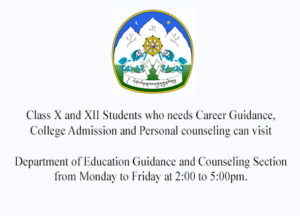 Citing examples from the history of the Tibetan empire, the Treaty of 821 AD etc. Dr Sangay destroyed Communist China’s claims that Tibet has been a part of Tibet since ancient times. Referring to the non-state nature of Central Tibetan Administration as a challenge, he spoke about its democratic set-up and how he was elected by the Tibetan electorate from across the diaspora. 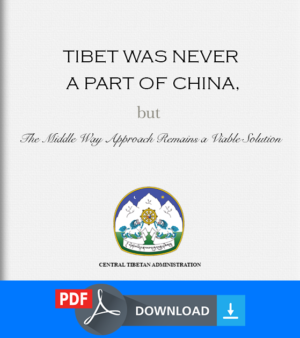 He mentioned the Middle Way Approach that seeks to resolve the Tibet issue through peaceful and non-violent means as the only viable solution to address the current tragic situation inside Tibet. Calling on the support of the European countries, including Finland, President Dr Sangay urged the governments in Europe to stand up to their founding principles and values, and raise their voices against repression and abuses of human rights, wherever it is committed. Commentaries to the President’s lecture were provided by SM Amadae, University Lecturer, and Laura Nordström, Doctoral Researcher, both of World Politics, University of Helsinki. 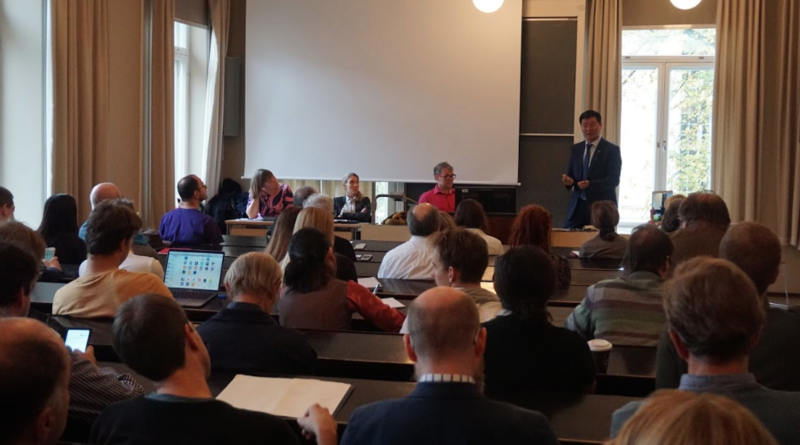 On his second public engagement of the day, President Dr Sangay spoke on Tibet as a water reservoir of Asia at an event jointly hosted by Siemenpuu NGO and the Finnish Tibet Committee, where he argued the case of Tibet from an environmentalist point of view. 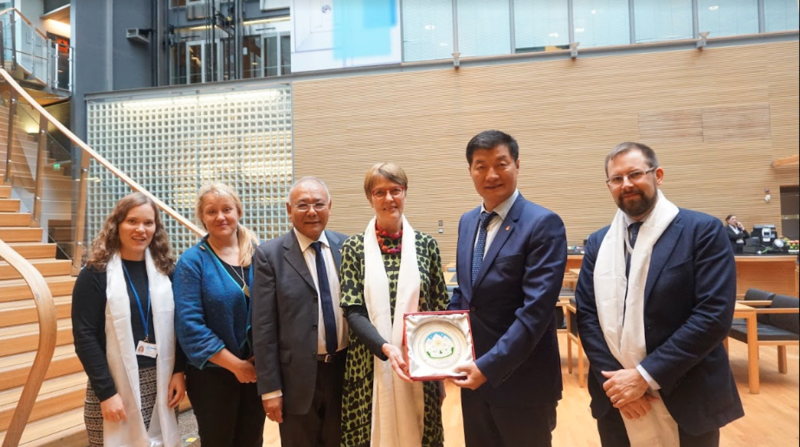 Driving home the significance of Tibet’s place as the roof of the world and the ‘Third Pole’, Dr Sangay reasoned with hard facts and statistics that it was both critical as well as crucial for the world to pay due attention to Tibet’s pristine environment. Through his passionate presentation, he called on the Chinese authorities to stop the damming of Tibet’s rivers, stop the forced resettlement of nomads from their pasture land and stop the illegal mining to preserve Tibet’s fragile ecosystem. The Q&A sessions at both events were interactive. The organisers streamed the public events live on their respective social media platforms for the benefit of a wider audience. There were also private meetings during the day, where the President met with Paavo Arhinmaki MP of the Left Alliance Parliamentary Group (and Former Minister of Culture & Sport; and former leader of the Left Alliance) in the morning; and later in the afternoon with Satu Hassi MP of the Green Party (first elected in 1991 and with ten years experience in the European Parliament; and former Leader of Green Party) and representative of the global group of Finnish parliament. 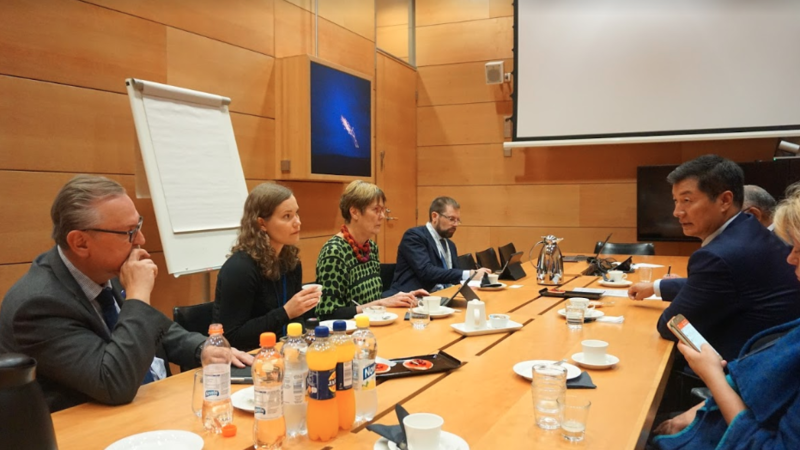 Both these meetings were held inside their respective offices in the Finnish Parliament Annex. 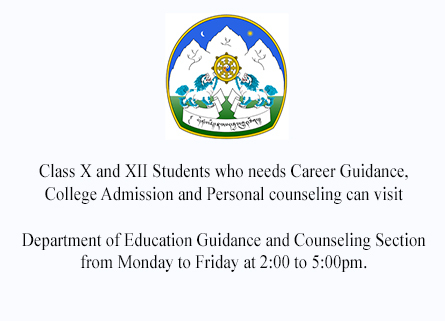 During these private meetings, Dr Sangay apprised them about the current situation inside Tibet. 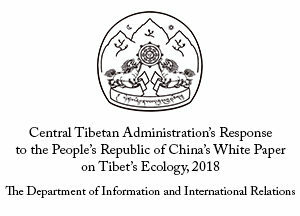 The subjects of discussion ranged from the lack of religious freedom inside Tibet, the demolitions carried out at centers of religious study such as Larung Gar and Yachen Gar, Tibetan self-immolations, the importance of preserving Tibet’s pristine environment for the world, to the Belt and Road Initiative. 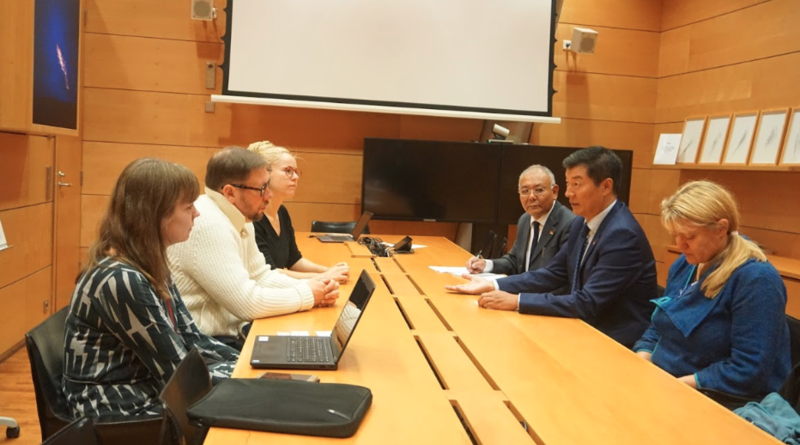 He impressed upon the Finnish politicians the need for the Finnish government to stand up to its founding principles and values such as liberty, human rights and freedom of speech in its dealings with China. To close his official engagements for the day, the Sikyong had dinner with Tibet supporters and friends during which he referred to the Thank You Year and expressed his appreciation and thanks to all for their support. 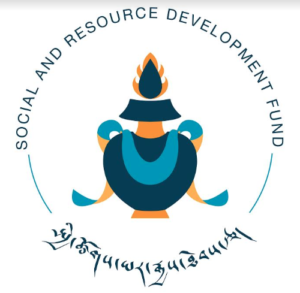 On Saturday, 13 October, President Dr Sangay will meet with Tibetans and will have an informal discussion with a select group of academicians and China watchers; as well as give a few media interviews. 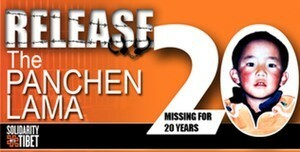 He returns to Delhi later in the night.